Hank, the star of the bestselling easy-to-read series, is back! This time, he has to learn the nuts and bolts of making a robot--and making a friend! Hank's school is hosting its first-ever Build-a-Robot competition and Hank is ready to win. There's just one problem: he completely forgot about the contest! While other kids have been working on their robots for a month, Hank has just two days to create an amazing robot that will wow the judges and win him the trophy. To make matters worse, there might be another problem, too. Hank has no idea how to build a robot! With help from Jaden, a robot expert at his school, Hank and his friends construct their robot, Stanley, just in time. But on the day of the competition, Stanley malfunctions! It will take Hank, Frankie, Ashley, and their new friend Jaden to get it back on track. 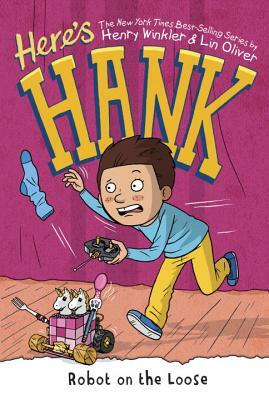 Forget winning the trophy--Hank has to stop a robot on the loose! Henry Winkler is an acomplished actor, producer, and director. He is most well known for playing The Fonz on the American sitcom Happy Days. In 2003, Henry added author to his list of acheivements as he coauthored a series of children's books. Inspired by the true life experiences of Henry Winkler, whose undiagnosed dyslexia made him a classic childhood underachiever, the Hank Zipzer series is based on the high-spirited and funny adventures of a boy with learning differences. Henry is married to Stacey Weitzman and they have three children.